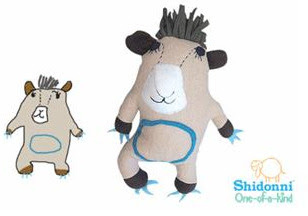 Custom stuffed animals: Kid doodles, Shidonni makes it! Shidonni is possibly the kewlest toy company. Ever. They will custom create a stuffed toy based on your child's own drawing. So it's about $80 for one of these, but I'm thinking that this might be something your child will either wear out entirely (And tell everyone: "I drew this!!!") or they will cherish it and keep it until they're adults. Either way, you can manage your child's account if they are too young because this has got to be the kewlest toy ever!!! To order, go here. If you order before tomorrow, you'll have it in time for Christmas.